From The New Zealand Garden Journal (Journal of the Royal New Zealand Institute of Horticulture), Vol. 1, No. 4, December 1996, pp. 16-19. John Ward and Margaret Folkard explore the history, use, and range of sundials available today. The articles are based on their book, Sundials Australia, the second edition was published in 1996. From these beginnings, methods for designing and constructing various types of sundial have been developed by many different cultures right through to the present day. Many articles have been written about the history of sundials. However, a large number of them use uncertain sources and are somewhat contradictory. Readers who are interested in pursuing in detail the fascinating study of sundials from the beginning of mankind's recorded history will find the following references helpful (Gatty 1900, Newton and Mayall 1938, Hogben 1946, Winthrop 1975, Gibbs 1976, Wilson 1980, Rohr 1982, Apel and Pytel 1990). The Greeks and Romans in particular created a great variety of sundial types and used them throughout their far-flung empires (Gibbs 1976). In the following paragraphs we give a brief outline of some of the most important events connected with time keeping in that part of the world. Anaximander of Miletus is believed to have introduced the first knowledge of sundials to Greece during the 6th century BC. The Greeks had many public sundials consisting of tall columns casting shadows onto the ground, and many citizens had their own sundials. Aristophanes' play 'The Frogs' written in 405 BC (Tucker 1906) contains the line "When the shadow is ten steps long, come to dinner"
About 340BC Berosus, a Chaldean astronomer-priest living in Egypt during the time of Alexander the Great, developed the hemisphericum, in which a vertical post was placed centrally inside a hollowed out hemisphere. The inside surface of the hemisphere had vertical lines carved on it to divide the daylight period into 12 hours, and horizontal lines to show the seasons. The shadow cast on the inside surface of the post marked out the path of the sun as it travelled across the sky. From this developed the hemicyclium, shown in Figure 2, which was widely used throughout the civilised world right up until the 14th century. 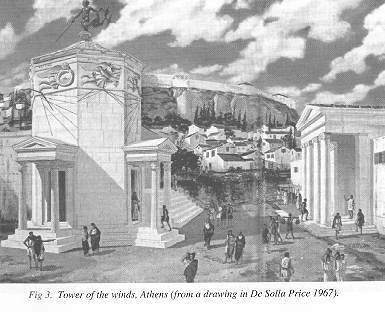 About 100BC the Tower of the Winds (De Solla Price 1967, Aked 1992, Aked 1993, De Solla Price and Noble 1968, and Figure 3) was erected in Athens at the foot of the North Slope of the Acropolis. This is an octagonal tower whose walls face towards the 8 cardinal directions North, South, East, West, North-East, North-West, South-East and South-West. It is so named because each wall features a carving with allegorical representations of the wind which blows from that particular direction, together with its name. Although it was primarily designed to contain a Clepsydra (waterclock), a large sundial with a horizontal rod gnomon was carved into each wall. The angle of the shadow on each sundial told the time, while the length of the shadows told the date, so the building acted as both clock and calendar. The Tower is accurately aligned North-South, so the sundial markings on the complementary faces (e.g., NE and NW) are repeated as mirror images. The carved lines of the sundials were reported as being very faint some 60 years ago, but today they are almost indistinguishable due to the ravages of pollution and acid rain. After all this time, it is not surprising that the gnomons are missing. In the following centuries the Greeks developed the sundial further, and experimented with hemicycles, conical dials, cylindrical dials and flat dials set at various angles. In those days, a system of unequal or temporary hours was in common use, with the available period of daylight divided into 12 parts  resulting in 12 long daylight hours in summertime and 12 short daylight hours in wintertime. Astronomers, however, used 'equal' hours (just as we do today) for charting the moving heavens. The Romans are not believed to have developed any new sundial types, but they certainly used all the Greek sundial developments, and sundials were extremely popular throughout their empire. Surviving specimens of Roman portable sundials have been found designed for latitudes from Britain through Narbonne in France to Ethiopia and Mauritius. Shrunk up with hunger, creep along the streets." The Roman architect, engineer and writer Vitruvius mentioned 13 kinds of sundials including portable types, in the 9th volume of his work on architecture 'De Architectura Libri Decem'. This treatise, containing two chapters dealing with gnomonics was published in 27 AD but was later lost, and only rediscovered in 1486 (Granger 1931-1934). One of the sundials discussed by Vitruvius was the pelekinon, the type built by the Emperor Augustus in Rome in 9 BC which covered a vast floor area of 180m x 110m and used a 30m tall obelisk from Heliopolis in Egypt as its vertical gnomon. This particular sundial will be discussed in a later article. In 150 AD Ptolemy of Alexandria (Ptolemaeus 1984, Peters and Knobel 1915) produced a book entitled 'He Mathematike Syntaxis ('The Mathematical Collection') which 9th century Arabic astronomers renamed the Almagest or 'Greatest Work'. In this work Ptolemy set forth his theory that the earth is stationary and at the centre of the universe, and that the Sun and the Moon and all the planets revolve around it. He also showed how to draw the hour lines of a sundial by projection and invented the analemma. His book was fortunate to survive the tragic burning of the great library at Alexandria in the mid 7th century AD. Although the Greek Aristarchus had suggested 400 years before Ptolemy that the Earth and other planets circle the Sun (Anon 1986), the Ptolemaic Earth-centred theory was taken virtually as an article of faith right up until the 16th century when it was replaced by the Copernican Sun-centred system (Copemicus 1976). However, the Earth-centred concept is still perfectly satisfactory for describing and designing sundials, so we are probably the only members of the human race still sticking to Ptolemaic principles! 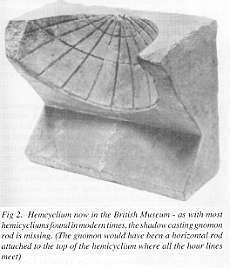 One of the many controversial dates in gnomonic history relates to when the gnomon of a sundial ceased being either vertical or horizontal, and was first inclined at the latitude angle to make it parallel to the axis of rotation of the Earth. Only when this happened could sundials tell time according to the system of equal hours. By the 14th century this method of constructing sundials had become common in Europe, and at about the same period mechanical clocks which divided the day into 24 equal hours started to appear. The early clocks were rare and very expensive, and not terribly accurate. They were often wrong by several hours and were frequently calibrated using sundials. Some mediaeval towns became famous because of their sundials  one example is Rothenburg ob der Tauber in Germany which still has many splendid sundials that were made long ago. In addition to telling the time using lines and numbers marked on a dial plate, sundials needed to have human appeal. Fine craftsmen developed high levels of artistic skill and decorated their sundials with embellishments of every kind. This artistic decoration, or 'furniture' as it is called, required many hours of labour to be carried out on both the dial plate and the gnomon (the part which casts the shadow). Many of these old sundials are now family heirlooms and very costly antiques which only museums and the like can afford to buy. 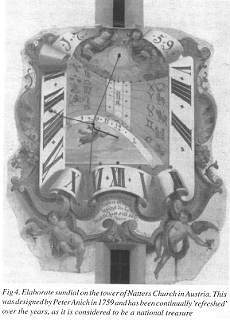 As a direct consequence of the design difficulties and the labour required to produce a sundial, most people were unable to afford the high cost of such instruments. Consequently the owners of these enduring sundials throughout history have been the wealthy and public institutions such as cathedrals, parks and town halls. Figures 4 and 5 illustrate typical elaborate and consequently expensive sundials. Countless sundials have been designed and made in every conceivable shape, size and form. The most commonly used materials for these sundials were copper, brass, bronze and stone, materials chosen mainly because of their ability to resist corrosion and because skilled craftsmen could work in these materials using traditional techniques. The time-telling hour lines marked on these old sundials were carefully placed in position using intricate graphical construction techniques which were based on sound geometric theory developed over many centuries. Hundreds of ancient sundial books abound which describe in confusing detail how to 'lay-out' or draw a sundial. These geometrical methods are complicated, tedious and very time consuming. Fortunately such methods can now be totally discarded. The ready availability of computers and pocket calculators allows even complicated sundials to be accurately designed using simple mathematical equations derived from the basic principles of spherical trigonometry. (The formulae that allow you to do this yourself will be given in a future article). Aked, C.K. 1992: The Tower of the Winds. Bulletin of the British Sundial Society No.92.3 & 93.1. Anon 1986: On the sizes and distances of the Sun and Moon. From Writings of Archimedes and Plutarch, Encyclopaedia Brittanica (15th edition) Vol. 1, p. 554. Apel, J. & Pytel, C. 1990: L'Ombre Domestique. Bonneyfoy, La Mesniere France. De Solla Price, D.J. 1967: Athen's Tower of the Winds. National Geographic Magazine Vol. 131, No. 4. De Solla Price, D.J. & Noble, J.V. 1968: The Waterclock in the Tower of the Winds. American Journal of Archaeology Vol. 72, p. 345-355. Dolan, W.W. 1975: A Choice of Sundials. The Stephen Green Press, Vermont, USA. Duncan, A.M. (translated). 1976: Copernicus: On the Revolutions of the Heavenly Spheres. David and Charles, Devon, UK. Gatty, A. 1900: The Book of Sundials. 4th edition. George Bell and Sons, London. Gibbs, S.L. 1976: Greek and Roman Sundials. Yale University Press, USA. Granger, F. 1931-1934: Vitruvius Pollio Marcus on Architecture. Laeb Classical Library, Book number 251, London. Hogben, L. 1946: Science for the Citizen. George Allen and Unwin, London. Mayal, R.M. & Mayal, M.W. 1973: Sundials, How to know, Use and Make them. 2nd edition. Sky Publishing Company, Cambridge, USA. Peters, C.H.F. & Knobel, E.B. 1915: Ptolemy's Catalogue of Stars: (A Revision of the Almagest). Washington Main Library USA. Rohr, R.R.J. 1982: Die Sonnenuhr. Callweg Verlag, Munchen, Germany. Toomer, G.J. 1984: Ptolemy's Almagest. Gerald Duckworth and Co Ltd, London. Tucker, T.G. 1906: The Frogs of Aristophanes. McMillan, UK. Wilson, C. 1980: The Book of Time. Westbridge Books, The Jacaranda Press. 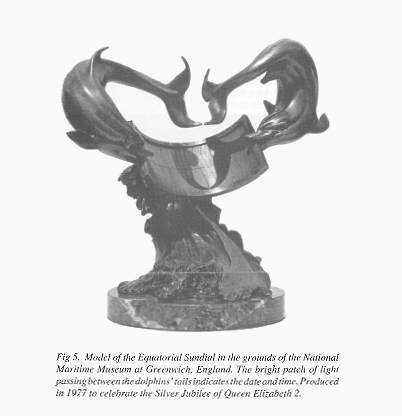 For more information on sundials, John Ward and Margaret Folkard have published the book, Sundials Australia. Published 1996, 113 pages, A4 size, 90 black and white photographs and 100 line drawings. This authoritative book includes relevant facts about the Earth, Sun and stars, and the various types of sundial, and the relationship between sun and clock time. Formulae for calculating hour lines are clearly listed. The blackness and sharpness of shadows is discussed. There is also a collection of mottoes, a dictionary of sundial terms, and a list of references. Price $A20 plus $A9 overseas postage. This book has briefly been reviewed on the RNZIH Horticulture Pages. It is available from Touchwood Books and listed by Sundials on the Internet (sponsored by the British Sundial Society) and the USA-based company SunPath Designs.